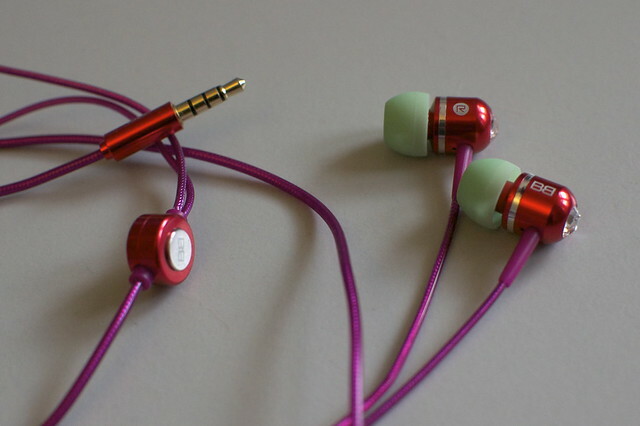 A few weeks ago I got sent a pair of BassBuds headphones to test out and review. I wasn’t really sure what to expect; judging by the site the BassBuds looked to be more of a fashion-statement type of headphone. You can choose from a large variety of colours (20 colour combinations in total!) 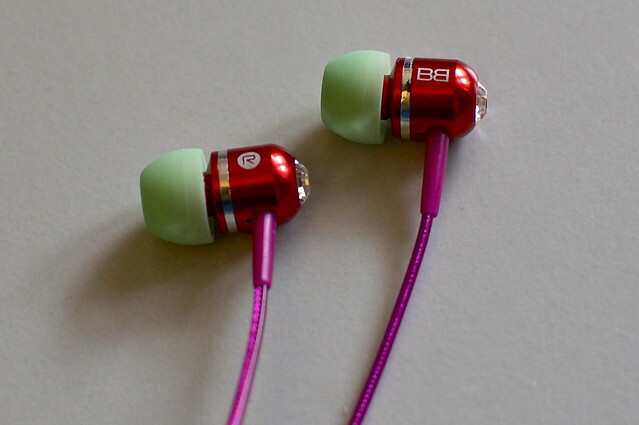 and each headphone comes with Swarovski crystals embedded in them. With that much focus on how it looked, would the sound quality be any good? 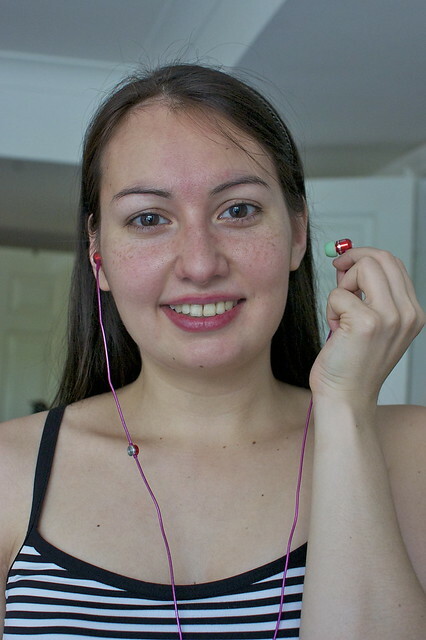 I got the Harmony design: light green earbuds, red aluminium housing and pink wire. It’s a bit Barbie-girl for my tastes (plus I was taught red and pink together clash), but I still really like the look of them (I think I would have preferred the pure red or silver ones, but, hey, at least these stand out). 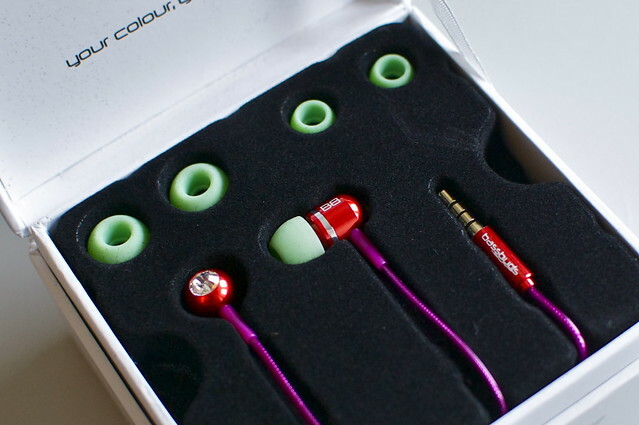 The BassBuds come in 20 different colours: 10 “pure” one-colour ones, and 10 unique combinations. No matter your colour tastes they’re bound to have a design that you like. Then there’s the Swarovski crystal… I’m not convinced by it. It’s too bling-bling for my tastes; the only way they could make it more blingy was to have it coated in gold. I do like how they look for the rest, I love the aluminium design design and the type of cable they’ve used, but I think I would have loved it more if it didn’t have Swarovski stone. The BassBuds use “Advanced Crystaltronics” to improve their sound, so I am wondering how much the Swarovski crystal contributes to their sound design. The headphones came with green memory foam earbuds in 3 different sizes (as you see in the picture above), plus 3 backup green ones and 3 extra black ones (so 2 backup ones that you can use). Half of the time earbuds start hurting with me after a while, but with these ones I haven’t had any trouble. They fit really comfortably and stay nicely in place. 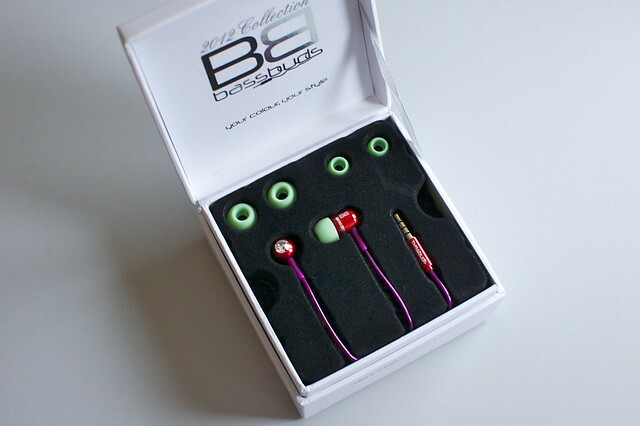 The BassBuds claim to have an “anti-tangle, durable” cable. While it still did tangle on occasion in my bag, I’ve had much less problems with these than with any other pair of headphones I’ve had. I wouldn’t go as far as calling it anti-tangle, but they are definitely not as tangle-ble (is that even a word??) as other headphones. The headphones also come with a microphone and a music control button. I only tested the microphone once on my laptop with Skype and it seemed to do a decent job, but I’d like to see how well it works on a phone. The control button is sturdy, but a bit simple. It only has the one button and depending on the amount of times you press it, it does different things (1x to mute, 2x to skip, 3x to go back, hold-in to do something that I don’t remember). The one thing I would have liked to seen here was a volume control; I like having my iPod in my bag and not having to touch it at all when I listen to stuff. So how did they sound? Pretty okay in my opinion. I had to change the equalizer settings on my iPod back to the default settings, cause the settings I was using made it sound wrong. After switching back to the default settings though, it all sounded much better. The sound is very clear and sharp. It made me notice the differences in quality in some of the mp3s I’ve got. The headphones do lack a certain something though; I lack the technical terms to describe it the right way, but it just doesn’t sound as warm, as complete as with some other headphones. For £35 headphones they’re pretty good. Do they block out the sound of a moving tube train (or a crying baby)? Depends on the amount of sound. They’re not the most-awesome-block-every-single-noise-out type of headphones, but they manage to block out a lot, while not having to amp up the volume. It did struggle with soft piano instrumental movie soundtracks, but if you’re listening to pop or rock you should be fine. At home they blocked out more than enough: maybe a bit TMI, but I completely didn’t hear a kitty vomiting 2 meters away from me with these in. Is there any sound leakage (aka will my fellow tube travellers give me the stink eye)? Nope. You barely hear anything coming from them when you’re listening to quite loud music. Holding them about 20cm away from me I could hear a slight beat, but nothing that would annoy people. Do they block out the sound of my own high heels? I know, this isn’t really tube related, but I’ve had in the past with some headphones that were perfectly fine in all other ways, that whenever I walked in my high heels the sound of them click-clacking on the ground would reverberate into my ear (which annoyed me so so much). These ones didn’t have any problems like that at all. Conclusion: I really liked these headphones. The main draw of them is how they look: the Swarovski stone, the different colours, the sleek design. They are very fashionable headphones. The design is practical, yet still pretty. 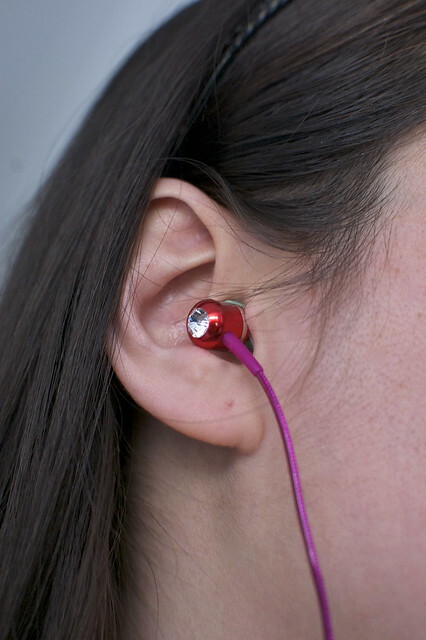 I liked the “anti-tangle” cable and the comfort of the earbuds. What I mainly loved about them though was how they sounded. Even though the focus seems to be on their appearance, they haven’t let down the quality of the sound. The BassBuds are available on their website for £35, but if you play their flashgame you can get up to £7.50 off (and if you manage to get into their leaderboard you get a chance to win a limited edition pair of BassBuds). They’re also available on Amazon.co.uk for £34.95. Disclaimer: The BassBuds were provided to me for review, free of charge.